With one of the most famous and populous cities in America, New York offers a wide variety of career opportunities for students graduating from criminal justice programs. With the help of these qualified learners, violent crime in New York City has been consistently declining since the 1990’s, no making it one of America’s safest large cities. There is always a need for criminal justice employees in New York’s smaller cities and provinces, though, working in the fields of criminal investigation, fishing and hunting enforcement, and a variety of other law professions. Read more below about the academic opportunities available to students interested in achieving a criminal justice career in New York state. After Criminal Justice School in New York: What's Next? Each student has individual career aspirations and academic needs, which is why selecting the right academic institution is the first crucial step of beginning a career in a criminal justice field. Comparing available schools can help students get a sense of what tuition cost, enrollment rates, and student-teacher ratios may align with their personal needs. To help students find the best school for them, we've analyzed criminal justice schools and programs across the country and found the top picks based on our methodology. 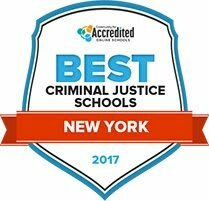 Explore the best criminal justice programs in New York for 2017 below. Traditional and dual criminal justice degree tracks are available at Niagara County Community College. Daytime classes are geared toward full-time students, while evening classes are geared toward part-time students. Admissions take place during September and January. Criminal justice specific courses are balanced with a robust offering of electives and general education and behavioral sciences classes. To earn the associate's degree, students must complete at least 62 credits and earn a 2.0 GPA or higher. At least 18 credits must be in criminal justice specific courses. Graduates of the program have worked in fields such as homeland security, local police departments, corrections and public defender's offices. Learning outcomes of the Monroe Community College criminal justice associate degree program include understanding how local, state and federal criminal justice systems operate, understanding procedural law and awareness of policies and current events that impact courts, policing, corrections and probation systems. The program operates under the college's School of Community Engagement and Development. It's possible to complete the entire program virtually. A total of 64 credits are built into the program. Areas that these credits are in are humanities, natural sciences, social sciences and criminal justice. In addition to general education and liberal arts electives, there are criminal justice elective requirements. Herkimer College's criminal justice associate's degree is geared toward adults who are interested in working in local law enforcement, probation, corrections, public safety or criminal court systems. Through its articulation agreements, students can transfer credits earned during the two-year program towards a bachelor's criminal justice degree. Focal areas of the associate's degree include juvenile justice, policing, criminology, private security and law. Gaining the skills to prevent crimes and rehabilitate those who break laws is a program outcome, as is knowing how to respond to crimes after they have been committed. There's an option to complete classes on campus or online. SUNY Broome Community College aims to prepare adults for a career in law enforcement, court systems and criminal justice rehabilitation through its two-year criminal justice degree program. Between 60 and 62.5 credits must be completed to earn the Associate of Applied Science in Criminal Justice degree. Courses like juvenile justice system, criminal law and constitutional law are supplemented with general education and electives in subjects such as foreign language and psychology. Before choosing electives, students are encouraged to consult with a department chair or criminal justice advisor. Full-time and part-time schedules are designed. Genesee Community College offers two associate's degrees and one certificate in the criminal justice field. Each learning track can be completed fully online. Students can also complete classes on campus. The associate degree programs are designed to help students progress toward the fulfillment of a bachelor's degree. Genesee has transfer agreements in place with four area colleges; each school is a part of the SUNY community. Policing, homeland security, corrections counseling and forensics are classes that students can expect to take. In addition to working for police departments, graduates can work for private security firms, public defender offices and public transportation security divisions. Hilbert College focuses on placing criminal justice graduates in law enforcement, investigation, corrections and corporate security professionals, among others. The program coursework covers a range of fields from forensic science to financial investigations to family counseling. Students have access to in-person and online academic and career resources, while the Criminal Justice and Forensic Science Association offers co-curricular guest speakers, community service events and events such as shooting range trips. Hilbert College is particularly focused on preparation for real-world experience; many professors are current or former law enforcement professionals and students can work with professors on research through Hilbert's Institute for Law and Justice. Morrisville State College's criminal justice program aims to provide a hands-on education, especially taking into account new technologies in forensic science, surveillance and crime scene investigation. Graduates are expected to competently identify, collect and preserve evidence, construct emergency plans, incorporate technological advances into their work and recognize diversity and cultural influences in human behavior. Morrisville also recognizes the growing need for qualified personnel in many fields of law enforcement and aims to prepare graduates to respond to this need. Along with standard coursework, Morrisville students work with an advisor to complete a nine-credit specialty discipline. Topics include white-collar crime, natural resources, adolescents and the criminal justice system. John Jay College provides a number of angles from which to study criminal justice. The Bachelor of Science degree focuses on evaluating the whole criminal justice system and how institutions from police to courts to corrections interact with one another. This degree serves as a foundation for public sector law enforcement employment, NGO research and private sector security or law firm positions. John Jay's Bachelor of Arts is more research-oriented. This program focuses on assessing the existing criminal justice system with the goal of improving it. Students will develop a research agenda and consider ethical and legal issues, ultimately developing a strong foundation for graduate school in criminal justice. There are also international criminal justice and criminology programs. This program's coursework focuses on the social and economic context of the criminal justice system. Program studies range from social statistics to class, race and gender to courts. Students can specialize in criminal behavior, criminal law or the criminal justice system. The College of Saint Rose also emphasizes its rigorous scientific approach to criminal justice education. Many students complete internships with the New York State Police Crime Laboratory or at state and federal courts, police departments or correctional institutions. Eligible College of Saint Rose students can also pursue research honors in collaboration with the School of Mathematics and Sciences. Graduates of Utica College's criminal justice program can seek employment in policing, law, security, counseling, research and many other fields in the public or private sectors. Utica's theory-into-practice model emphasizes participation in departmental research that culminates in a semester-long capstone internship. Co-curricular opportunities for criminal justice students include the Organization for Justice Studies, which offers trips and interactions with experts in the field. The program is designed to prepare students for advanced study in criminal justice and criminology, law, management and public administration. Utica College alumni have taken positions with the New York Office of the Attorney General, the Department of the Treasury and the Secret Service. Using the following search tool will allow students to weed out any schools that don’t fit their academic needs and find the program that will guide them to a fulfilling career in criminal justice. Students may compare the cost of any available programs, total student populations, and the different levels of available degree programs at each institution. Graduates from all backgrounds may find criminal justice employment in New York, whether they are working as a criminal investigator or in a more court-based setting. The following table breaks down some of the career paths open to criminal justice graduates in terms of salary and employment rate, giving them a clear idea of which programs can lead to the career of their interest. New York’s criminal justice employees are payed slightly higher than the national average for criminal justice fields, as is outlined in the following table. Students may also utilize this table to review the projected job growth for criminal justice careers in New York between now and 2024, as careers in New York are likely to expand more rapidly than in other states. When searching for an employer, it is important to keep in mind the large selection potential careers available in specific areas throughout New York. The table below highlights some of the possible careers available to New York criminal justice graduates, detailing specific jobs in terms of location, total number of hired employees, and annual wage. Amy Poland, PhD, is the Associate Dean for Online Learning and an associate professor in the Department of Criminal Justice at St. Joseph’s College. Prior to moving to Long Island, she began her career in criminal justice working with juvenile offenders in a residential treatment facility while she finished her Master’s in public administration. She completed her PhD in criminal justice and taught at Buena Vista University in Storm Lake, Iowa and Texas A&M International University in Laredo, Texas. What makes criminal justice a rewarding subject to study? ACriminal justice is an interdisciplinary subject that integrates fields such as sociology, psychology, biology, and political science as well as criminal justice to study criminal behavior and the criminal mind. One of the most important aspects of the criminal justice field is the development of critical thinking skills, enabling future criminal justice professionals to deal with real world problems, sometimes with little time to make good decisions. It is a constantly evolving field and students learn why laws are created to make certain behaviors criminal. In addition, while it is impossible to predict human behavior, students learn the reasons crimes are committed and who is more likely to commit crimes. Studying criminal justice requires an understanding of the relationship between the community, governing bodies and individuals; students are challenged to balance the safety of the community with the individual rights of those who are accused of crimes. One of the most rewarding aspects of studying criminal justice for me as both a student and instructor is the ability to apply theoretical knowledge to real-world situations, both in the classroom and during experiential learning such as service-learning or internships. There is no lack of examples both in the news and in television crime dramas of the criminal justice system operating in ways that differ from what is taught in the classroom. Both provide opportunities for student learning through discussions, such as why the television crime dramas are unrealistic and how the use of discretion by law enforcement, prosecutors, judges, and correctional officials can create widely different outcomes in similar criminal events. What kinds of courses can criminal justice students expect to take in a degree program? AThe courses in a criminal justice degree include courses about the criminal justice system including law enforcement, courts, and corrections. Student will also study criminology (the theories of why crimes occur), ethics, race/ethnicity and crime, gender and crime, research methods, and will typically apply all of the knowledge they have acquired in a culminating internship. Students will also have the ability to study specific topics within criminal justice of particular interest to them such as mental health, substance abuse, or forensic science. Additional courses are offered based on the population and types of crimes that occur and can include topics such as drugs and crime, terrorism, organized crime, and cybercrime. What makes criminal justice an interesting career to pursue? AWorking in the criminal justice field provides an opportunity to serve your community and make a difference in people’s lives. For victims and the community, criminal justice professionals work to keep individuals and their property safe. This can include enforcing the laws, prosecuting offenders, or supervising inmates in jail or prison. It can also include protecting the nation from terroristic threats both from within the United States, as well as from foreign terrorist groups. When working with offenders, criminal justice offenders have the opportunity to help them turn their lives around and become prosocial members of the community. When this is successful, it is rewarding for the offender and their family and shows the criminal justice professionals who have helped to bring about the change that they are making a real difference in their community. What careers are available in New York to those who complete criminal justice degrees? AStudents with a criminal justice degree can work in a variety of careers in New York. Law enforcement opportunities exist at the city, county, state and federal level. Local agencies include the New York Police Department, Port Authority of New York and New Jersey (protecting public transit, bridges, tunnels, airports, and sea ports in the New York metropolitan area), local police departments and sheriff’s offices. State law enforcement opportunities include New York state troopers, environmental conservation, and criminal investigations. Several federal law enforcement agencies have offices in New York including the Federal Bureau of Investigation, Customs and Border Patrol, Homeland Security, U.S. Marshals, Air Marshals, and Transportation Security Administration. Other law enforcement careers include private detective and/or private security work or specialized fields, such as cybersecurity or information security analysts. These careers often require additional specialized education. Students who want to work in the criminal court system can go to law school and become either a prosecutor or defense attorney. They can also become judges at the local, state, or federal level. Other careers in the court system include paralegals, court clerks, and court officers charged with keeping the peace within the courtroom as well as transporting those accused of crimes between the court and jail. Within corrections, students can find careers as a correctional officer in prisons, jails or juvenile detention centers. These careers can potentially lead to supervisory roles up to and including prison warden. For those interested in working with offenders in the community, careers in probation and parole are available at the state and federal level. Students can also find jobs in community residential placements, halfway houses, or working with private service providers who work with offenders such as mental health or substance abuse providers. What makes the criminal justice field unique in New York? AUnlike some states, a good number of the criminal justice careers in New York are governed by a fairly rigid civil service law. Job entry is often exam-based and hiring is done strictly according to this exam and list system. Of course, there are benefits and drawbacks to this style of hiring, but those choosing to enter this field should be prepared for basic testing in addition to having the appropriate educational background for their desired field of work. Also, the New York City metropolitan region in particular has arguably the most overlapping criminal justice related agencies anywhere in the nation. This unique environment brings employees from government and criminal justice careers in frequent contact with countless other agencies. An ability to collaborate is essential in a busy urban area with many criminal justice agencies and government jurisdictions like New York. How can students best prepare to enter the field? AIntegrity and public trust are paramount in criminal justice work. Candidates for careers in this field would do best to keep this in mind from the earliest stages of young adulthood, as government jobs—particularly in law enforcement—will require the candidate to display outstanding moral character. Criminal record and arrest history, negative interactions with law enforcement, drug use, and other personal history that demonstrate poor ethical choices will be carefully scrutinized and can quickly curb one's aspirations for a career in criminal justice. Criminal justice students and those seeking employment must always keep this in mind, as it can be difficult to recover from past indiscretions like these. What qualities does someone need to be successful in a criminal justice-related job? AMost of the jobs in the criminal justice field center around public service. It is therefore no surprise that candidates are expected to display the highest integrity and the type of professionalism that the public demands from its criminal justice professionals. Also, a strong but diverse educational background is always an asset. Persons interested in this field should take advantage of as many educational and training opportunities as they can to build a well-rounded portfolio of experience. Beyond traditional undergraduate and post-graduate schooling, many government agencies offer training programs, many at no cost, that include topics such as emergency management, homeland security, terrorism awareness, emergency medicine, and crisis management, for example. Given the media reports on the amount of violence in big cities like New York City, should people who want to enter the criminal justice field be concerned about their safety? AThankfully, there is little reason for career seekers to be concerned about their safety working or living in New York City. While violent crime is up in many large cities, New York has countered that trend and remains among the safest cities in the United States. In 2014 and 2015 we recorded two of the three lowest years in crime—including the lowest for murders since the 1950s. That trend has continued in the first half of this year. The decline in shootings is specifically noteworthy. While many American cities have experienced surges in shootings and murders, shootings in New York have dipped yet again—and are on track to hit an all-time low by the end of this year. Criminal justice students and career seekers have good reason to not only feel safe, but to be inspired by the successes in New York City. Playing a part in this continued success is part of what makes joining a worthwhile career of service in criminal justice so rewarding. This page details the support available to New York state citizens looking to start small businesses, as well as options for international businesses and veteran-owned businesses. The SBCD also provides regulatory guidance services. Information for workers and business-owners about employment in New York state. This division of the office of the secretary of New York state examines, files, and maintains various business and state government documents including state and local laws, oaths of office, trademarks, certificates of incorporation, and financing statements. A resource for statewide economic development programs in New York for businesses looking to develop, grow, or move to the state. The BCNYS connects business owners from around the state with resources and government advocacy for business interests. The NYC chapter of the ACC provides resources for corporate lawyers who are members of the group. This page allows users to search for official public records and documentation about licensed business entities in the state of New York. For those interested in learning more about joining New York state’s Department of Corrections, this page details career descriptions and benefits, and offers current job postings. This recruitment website has information on training, exams, and employment in New York City’s corrections department. This site provides information and resources about juvenile justice programs in the state of New York. The CA is a non-profit organization that is dedicated to advocating for a more human and effective criminal justice system. The NYSPOA provides a support system, information and resources for New York state’s probation officers. The association is membership-based and organizes a conference for its members. The career page for nonjudicial employees in New York state, including information on certifying exams. The website also has information about New York’s courts and criminal justice employees. A links page to information on New York’s court system, including various courts and facilities. Links to appellate and bankruptcy courts; New York’s district, state, and local courts; laws and regulations; lawyer resources; state agencies; and various departments that may assist with legal education opportunities or other judicial system information within Idaho. The New York state chapter of the Court Appointed Special Advocates provides advocacy for children who have been abused and/or neglected so that they can ultimately be placed in safe, permanent homes. The NYSCRA is a membership-based organization that provides continuing education and networking for court reporters. The New York State Magistrates Association promotes the education and exchange of ideas for magistrates throughout the state. The New York branch of the ACLU provides news and blogs on current events and local issues as well as information on how to get involved with local civil liberties cases. This national society has information on military legal assistance and military-specific legal programs, pro bono work, and lawyer referral programs in New York. An organization for lawyers and legal professionals. It has information on publications, events, and further education as well as leadership and advocacy opportunities. This directory lists the many minority-specific bar associations throughout the state of New York which includes racial, ethnic, gender and LGBT groups. The ESAPA is a combination of paralegal associations from around the state that come together to share professional resources and information. The Attorney General’s office is responsible for consumer protection and for providing legal counsel to state employees and entities. The official website for New York City’s police department. The site has information on the city’s police academy. Along with community resources, this page has links to information about law enforcement trainings and accreditations. A page on becoming a chief of police in New York. The website has links to further resources, including podcasts and continuing education programs. Information on police training academy in the state of New York, ranging from basic education and training to more specialized courses. The NYSTPBA advocates for New York state troopers by meeting with state legislators to seek fair wages, safe conditions, benefits and more for members. The New York State Sheriffs’ Association provides resources, training, information and events for its members. ALSDONYS is a membership-based organization that provides networking, events and advocacy for licensed private investigators in New York. Information on being an environmental conservation police officer in New York, including links to employment and areas of employment within the state. The National Park Service employs rangers and other people interested in conserving national parks, and there are employment opportunities in Chesapeake Bay and the Appalachian Trail. Links and contact information for New York state’s offices of the national fish and wildlife services. Park police officers enforce laws and regulations around New York’s natural resources to keep wildlife and visitors safe.